Can also enjoy the beauty of the city with a boat ride along the Moscow River. This can only be done at the end of April to October because of the weather in November is often already hostile. A cold wind began to blow, the snow is not uncommon even begin to address the drift though limited to cotton. In the winter, it is not uncommon river water freezes making it difficult to pass the ship. These freighter mostly tourists starting next station or Kievsky Vokzal Kiev and ending at the dock near the Dom Muziki or otherwise. From the splendor of the ship could be seen Stalin skyscraper known as the Seven Sisters, the Kremlin along with the President’s Palace, the Cathedral White Khram Khrista Spasitelya, spacious park in the city center Varobgyovy Gory, the beauty of the Church of St.. Basil and Peter The Great Statue with pride ship Tsereteli’s works. 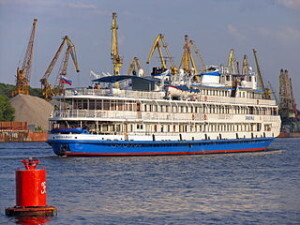 It takes about 1.5 hours to be able to enjoy a river cruise Moscow in a single trip. There are also boats that offer a route back and forth, such as cruise ships and small Horisson Hotel starting from Love Lock Bridge, near the Tretyakov Gallery. Along the river there is a dock dismissal. Travelers can ride and sit as you wish, and you have to pay around 400 rubles tickets for all distances in a single trip. Cruise ship Horisson offers luxurious, equipped with restaurant facilities. Departing and returning from the Hotel Ukraine. The cost of tickets to 700 rubles if you want to taste the food d in, to other facilities you would need to pay more. It’s beautiful, around Moscow by ship at the end of the visit can be described as a conlusion tour after a few days down the congested streets of Moscow. To be able to go to this place, you can just use the metro and stop at the station Kievskaya.